William O'Brien, 4th Earl of Inchiquin, KB, PC(I) (1700 - 18 July 1777) was a British peer and politician. Inchiquin was Whig Member of Parliament for Windsor from 1722 to 1727, for Tamworth from 1727 to 1734, for Camelford from 1741 to 1747 and for Aylesbury from 1747 to 1754. In 1725, he had been appointed a Knight Companion of the Order of the Bath. ​From 1740 to 1741, he was Grand Master of the Premier Grand Lodge of England, Governor of County Clare from 1741 to 1777 and Custos Rotulorum of County Clare from 1762 to 1767. From 1744 to 1751, he was a Lord of the Bedchamber to Frederick, Prince of Wales and admitted to the Privy Council of Ireland in 1753. 1722-1727 Succeeded by Lord Vere Beauclerk Viscount Malpas Preceded by Hon. Francis Willoughby. Preceded by Charles Pilsworth Hon. William StanhopeMember of Parliament for Aylesbury. The first headquarters of the Knights Templar on the Temple Mount in Jerusalem. The Crusaders called it the Temple of Solomon and it was from this location that the Knights took their name of Templar. After the First Crusade captured Jerusalem in 1099, many Christian pilgrims travelled to visit what they referred to as the Holy Places. However, though the city of Jerusalem was under relatively secure control, the rest of Outremer was not. Bandits abounded, and pilgrims were routinely slaughtered, sometimes by the hundreds, as they attempted to make the journey from the coastline at Jaffa into the Holy Land. Around 1119, the French knight Hugues de Payens approached King Baldwin II of Jerusalem with the proposal of creating a monastic order for the protection of these pilgrims. King Baldwin agreed to the request, and granted space for a headquarters in a wing of the royal palace on the Temple Mount, in the captured Al-Aqsa Mosque. The Temple Mount had a mystique because it was above what was believed to be the ruins of the Temple of Solomon. The Crusaders therefore referred to the Al Aqsa Mosque as Solomon's Temple, and it was from this location that the new Order took the name of Poor Knights of Christ and the Temple of Solomon, or "Templar" knights. The Order, with about nine knights including Godfrey de Saint-Omer and André de Montbard, had few financial resources and relied on donations to survive. Their emblem was of two knights riding on a single horse, emphasizing the Order's poverty. A Templar Knight is truly a fearless knight, and secure on every side, for his soul is protected by the armour of faith, just as his body is protected by the armour of steel. He is thus doubly armed, and need fear neither demons nor men." De Laude Novae Militae—In Praise of the New Knighthood The Templars' impoverished status did not last long. They had a powerful advocate in SaintBernard of Clairvaux, a leading Church figure and a nephew of André de Montbard, one of the founding knights. Bernard spoke and wrote persuasively on their behalf, and in 1129 at the Council of Troyes the Order was officially endorsed by the Church. With this formal blessing, the Templars became a favored charity throughout Christendom, receiving money, land, businesses, and noble-born sons from families who were eager to help with the fight in the Holy Land. Another major benefit came in 1139, when Pope Innocent II's papal bull Omne Datum Optimul exempted the Order from obedience to local laws. This ruling meant that the Templars could pass freely through all borders, were not required to pay any taxes, and were exempt from all authority except that of the pope. With its clear mission and ample resources, the Order grew rapidly. Templars were often the advance force in key battles of the Crusades, as the heavily armoured knights on their warhorses would set out to charge at the enemy, in an attempt to break opposition lines. One of their most famous victories was in 1177 during theBattle of Montgisard, where some 500 Templar knights helped several thousand infantry to defeat Saladin's army of more than 26,000 soldiers. Pilgrims deposited their valuables with a local Templar preceptory before embarking, received a document indicating the value of their deposit, then used that document upon arrival in the Holy Land to retrieve their funds. This innovative arrangement was an early form of banking, and may have been the first formal system to support the use of cheques; it improved the safety of pilgrims by making them less attractive targets for thieves, and also contributed to the Templar coffers. Battle of the Horns of Hattin in 1187, the turning point in the Crusades Decline In the mid-12th century, the tide began to turn in the Crusades. The Muslim world had become more united under effective leaders such as Saladin, and dissension arose among Christian factions in and concerning the Holy Land. The Knights Templar were occasionally at odds with the two other Christian military orders, the Knights Hospitaller and the Teutonic Knights, and decades of internecine feuds weakened Christian positions, politically and militarily. After the Templars were involved in several unsuccessful campaigns, including the pivotal Battle of the Horns of Hattin, Jerusalem was captured by Saladin's forces in 1187. The Crusaders retook the city in 1229, without Templar aid, but held it only briefly. In 1244, the Khwarezmi Turks recaptured Jerusalem, and the city did not return to Western control until 1917 when the British captured it from theOttoman Turks. The Templars were forced to relocate their headquarters to other cities in the north, such as the seaport of Acre, which they held for the next century. But they lost that, too, in 1291, followed by their last mainland strongholds, Tortosa (in what is now Syria), and Atlit. Their headquarters then moved to Limassol on the island of Cyprus, and they also attempted to maintain a garrison on tiny Arwad Island, just off the coast from Tortosa. In 1300, there was some attempt to engage in coordinated military efforts with the Mongols via a new invasion force at Arwad. In 1302 or 1303, however, the Templars lost the island to the Egyptian Mamluks in the Siege of Arwad. With the island gone, the Crusaders lost their last foothold in the Holy Land. With the Order's military mission now less important, support for the organization began to dwindle. The situation was complex though, as over the two hundred years of their existence, the Templars had become a part of daily life throughout Christendom. The organization's Templar Houses, hundreds of which were dotted throughout Europe and the Near East, gave them a widespread presence at the local level. The Templars still managed many businesses, and many Europeans had daily contact with the Templar network, such as by working at a Templar farm or vineyard, or using the Order as a bank in which to store personal valuables. The Order was still not subject to local government, making it everywhere a "state within a state"—its standing army, though it no longer had a well-defined mission, could pass freely through all borders. This situation heightened tensions with some European nobility, especially as the Templars were indicating an interest in founding their own monastic state, just as the Teutonic Knights had done in Prussia and the Knights Hospitaller were doing with Rhodes. Arrests, charges, and dissolution King Philip IV of France (1268–1314) In 1305, the new Pope Clement V, based in France, sent letters to both the Templar Grand Master Jacques de Molay and the Hospitaller Grand Master Fulk de Villaret to discuss the possibility of merging the two Orders. Neither was amenable to the idea, but Pope Clement persisted, and in 1306 he invited both Grand Masters to France to discuss the matter. De Molay arrived first in early 1307, but de Villaret was delayed for several months. While waiting, De Molay and Clement discussed charges that had been made two years prior by an ousted Templar. It was generally agreed that the charges were false, but Clement sent King Philip IV of France a written request for assistance in the investigation. King Philip was already deeply in debt to the Templars from his war with the English and decided to seize upon the rumors for his own purposes. He began pressuring the Church to take action against the Order, as a way of freeing himself from his debts. On Friday, October 13, 1307 (a date sometimes spuriously linked with the origin of the Friday the 13th superstition) Philip ordered de Molay and scores of other French Templars to be simultaneously arrested. The arrest warrant started with the phrase : "Dieu n'est pas content, nous avons des ennemis de la foi dans le Royaume" ["God is not pleased. We have enemies of the faith in the kingdom"]. The Templars were charged with numerous offences (including apostasy, idolatry, heresy, obscene rituals and homosexuality, financial corruption and fraud, and secrecy). Many of the accused confessed to these charges under torture, and these confessions, even though obtained under duress, caused a scandal in Paris. All interrogations were recorded on a thirty metre long parchment, kept at the "Archives nationales" in Paris. The prisoners were coerced to confess that they had spat on the Cross : "Moi Raymond de La Fère, 21 ans, reconnais que (J'ai) craché trois fois sur la Croix, mais de bouche et pas de coeur" (free translation : "I, Raymond de La Fère, 21 years old, admit that I have spat three times on the Cross, but only from my mouth and not from my heart"). The Templars were accused of idolatry. Templars being burned at the stake. Pope Clement called for papal hearings to determine the Templars' guilt or innocence, and once freed of the Inquisitors' torture, many Templars recanted their confessions. Some had sufficient legal experience to defend themselves in the trials, but in 1310 Philip blocked this attempt, using the previously forced confessions to have dozens of Templars burned at the stake in Paris. Convent of Christ in Castle Tomar, Portugal. Built in 1160 as a stronghold for the Knights Templar, it became the headquarters of the renamed Order of Christ. In 1983, it was named a UNESCO World Heritage Site.With Philip threatening military action unless the pope complied with his wishes, Pope Clement finally agreed to disband the Order, citing the public scandal that had been generated by the confessions. At the Council of Vienne in 1312, he issued a series of papal bulls, including Vox in excelso, which officially dissolved the Order, and Ad providam, which turned over most Templar assets to the Hospitallers. As for the leaders of the Order, the elderly Grand Master Jacques de Molay, who had confessed under torture, retracted his statement. His associate Geoffroi de Charney, Preceptor of Normandy, followed de Molay's example and insisted on his innocence. Both men were declared guilty of being relapsed heretics, and they were sentenced to burn alive at the stake in Paris on March 18, 1314. "God knows who is wrong and has sinned. Soon a calamity will occur to those who have condemned us to death"). Pope Clement died only a month later, and King Philip died in a hunting accident before the end of the year. With the last of the Order's leaders gone, the remaining Templars around Europe were either arrested and tried under the Papal investigation (with virtually none convicted), absorbed into other military orders such as the Knights Hospitaller, or pensioned and allowed to live out their days peacefully. By papal decree, the property of the Templars was transferred to the Order of Hospitallers, which also absorbed many of the Templars' members. In effect, the dissolution of the Templars could be seen as the merger of the two rival orders. Some may have fled to other territories outside Papal control, such as excommunicated Scotland or to Switzerland. Templar organizations in Portugal simply changed their name, from Knights Templar to Knights of Christ – see Order of Christ (Portugal). Chinon Parchment Main article: Chinon Parchment In September 2001, a document known as the "Chinon Parchment" dated 17–20 August 1308 was discovered in the Vatican Secret Archives by Barbara Frale, apparently after having been filed in the wrong place in 1628. It is a record of the trial of the Templars and shows that Clement absolved the Templars of all heresies in 1308 before formally disbanding the Order in 1312, as did another Chinon Parchment dated 20 August 1308 addressed to Philip IV of France, also mentioning that all Templars that had confessed to heresy were "restored to the Sacraments and to the unity of the Church". This other Chinon Parchment has been well known to historians having been published by Étienne Baluze in 1693, and by Pierre Dupuy in 1751. The current position of the Roman Catholic Church is that the medieval persecution of the Knights Templar was unjust, that nothing was inherently wrong with the Order or its Rule, and that Pope Clement was pressed into his actions by the magnitude of the public scandal and by the dominating influence of King Philip IV. Organization Templar chapel from the 12th C. in Metz, France. Once part of the Templar commandery of Metz, the oldest Templar institution of the Holy Roman Empire. The Templars were organized as a monastic order similar to Bernard's Cistercian Order, which was considered the first effective international organization in Europe.The organizational structure had a strong chain of authority. Each country with a major Templar presence (France,England, Aragon, Portugal, Poitou, Apulia, Jerusalem, Tripoli, Antioch, Anjou, Hungary, and Croatia) had a Master of the Order for the Templars in that region. All of them were subject to the Grand Master, appointed for life, who oversaw both the Order's military efforts in the East and their financial holdings in the West. Ranks within the order. Three main ranks There was a threefold division of the ranks of the Templars: the aristocratic knights, the lower-born sergeants, and the clergy. Knights were required to be of knightly descent and to wear white mantles. They were equipped as heavy cavalry, with three or four horses and one or two squires. Squires were generally not members of the Order but were instead outsiders who were hired for a set period of time. Beneath the knights in the Order and drawn from lower social strata were the sergeants. They were either equipped as light cavalry with a single horseor served in other ways such as administering the property of the Order or performing menial tasks and trades. Chaplains, constituting a third Templar class, were ordained priests who saw to the Templars' spiritual needs. Grand Masters Main article: Grand Masters of the Knights Templar Templar building at Saint Martin des Champs, France Starting with founder Hugues de Payens in 1118–1119, the Order's highest office was that of Grand Master, a position which was held for life, though considering the martial nature of the Order, this could mean a very short tenure. All but two of the Grand Masters died in office, and several died during military campaigns. For example, during the Siege of Ascalon in 1153, Grand Master Bernard de Tremelay led a group of 40 Templars through a breach in the city walls. When the rest of the Crusader army did not follow, the Templars, including their Grand Master, were surrounded and beheaded.Grand Master Gérard de Ridefort was beheaded by Saladin in 1189 at the Siege of Acre. Behaviour and dress It was Bernard de Clairvaux and founder Hugues de Payens who devised the specific code of behaviour for the Templar Order, known to modern historians as the Latin Rule. Its 72 clauses defined the ideal behaviour for the Knights, such as the types of garments they were to wear and how many horses they could have. Knights were to take their meals in silence, eat meat no more than three times per week, and not have physical contact of any kind with women, even members of their own family. A Master of the Order was assigned "4 horses, and one chaplain-brother and one clerk with three horses, and one sergeant brother with two horses, and one gentleman valet to carry his shield and lance, with one horse. As the Order grew, more guidelines were added, and the original list of 72 clauses was expanded to several hundred in its final form. One of the many reported flags of the Knights Templar The knights wore a white surcoat with a red cross and a white mantle; the sergeants wore a black tunic with a red cross on front and back and a black or brown mantle.The white mantle was assigned to the Templars at the Council of Troyes in 1129, and the cross was most probably added to their robes at the launch of the Second Crusade in 1147, when Pope Eugenius III, King Louis VII of France, and many other notables attended a meeting of the French Templars at their headquarters near Paris. According to their Rule, the knights were to wear the white mantle at all times, even being forbidden to eat or drink unless they were wearing it. The red cross that the Templars wore on their robes was a symbol of martyrdom, and to die in combat was considered a great honor that assured a place in heaven.There was a cardinal rule that the warriors of the Order should never surrender unless the Templar flag had fallen, and even then they were first to try to regroup with another of the Christian orders, such as that of the Hospitallers. Only after all flags had fallen were they allowed to leave the battlefield.This uncompromising principle, along with their reputation for courage, excellent training, and heavy armament, made the Templars one of the most feared combat forces in medieval times. New members had to willingly sign over all of their wealth and goods to the Order and take vows of poverty, chastity, piety, and obedience.Most brothers joined for life, although some were allowed to join for a set period. Sometimes a married man was allowed to join if he had his wife's permission, but he was not allowed to wear the white mantle. Legacy Temple Church, London. As the chapel of the New Temple in London, it was the location for Templar initiation ceremonies. In modern times it is the parish church of the Middle and Inne Temples, two of the Inns of Court. It is a popular tourist attraction. See also: List of places associated with the Knights Templar With their military mission and extensive financial resources, the Knights Templar funded a large number of building projects around Europe and the Holy Land. Many of these structures are still standing. Many sites also maintain the name "Temple" because of centuries-old association with the Templars.For example, some of the Templars' lands in London were later rented to lawyers which led to the names of the Temple Bar gateway and the Temple tube station. Two of the four Inns of Court which may call members to act as barristers are the Inner Temple and Middle Temple. 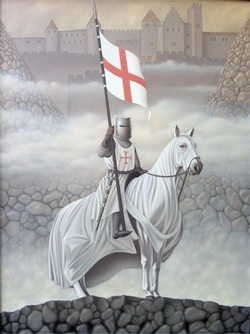 Modern organizations Main article: Knights Templar and popular culture. The story of the secretive yet powerful medieval Templars, especially their persecution and sudden dissolution, has been a tempting source for many other groups which have used alleged connections with the Templars as a way of enhancing their own image and mystery.There is no clear historical connection between the Knights Templar, which were dismantled in the 14th century, and any of the modern organizations, of which the earliest emerged publicly in the 18th century, and are referred to as Neo-Templars by some authors. However, there is often public confusion and many overlook the 400-year gap. Freemasonry Main article: Knights Templar (Freemasonry) Since at least the 18th century Freemasonry has incorporated Templar symbols and rituals in a number of Masonic bodies,most notably, the "Order of the Temple" the final order joined in "The United Religious, Military and Masonic Orders of the Temple and of St John of Jerusalem, Palestine, Rhodes and Malta" commonly known as the Knights Templar. One theory of the origins of Freemasonry claims direct descent from the historical Knights Templar through its final fourteenth-century members who took refuge in Scotland, or other countries where the Templar suppression was not enforced. This theory is usually deprecated on grounds of lack of evidence, by both Masonic authorities and historians. Legends and relics Main article: Knights Templar legends The Knights Templar have become associated with legends concerning secrets and mysteries handed down to the select from ancient times. Rumors circulated even during the time of the Templars themselves. Freemasonic writers added their own speculations in the 19th century, and further fictional embellishments have been added in popular novels such as Ivanhoe, Foucault's Pendulum, The Lost symbol, and The Da Vinci Code. modern movies such as National Treasure and Indiana Jones and the Last Crusade; and video games such as Assassin's Creed and Broken Sword. Many of the Templar legends are connected with the Order's early occupation of the Temple Mount in Jerusalem and speculation about what relics the Templars may have found there, such as the Holy Grail or the Ark of the Covenant. That the Templars were in possession of some relics is certain. Many churches still display holy relics such as the bones of a saint, a scrap of cloth once worn by a holy man, or the skull of a martyr; the Templars did the same. They were documented as having a piece of the True Cross, which the Bishop of Acre carried into battle at the disastrous Horns of Hattin.When the battle was lost, Saladin captured the relic, which was then ransomed back to the Crusaders when the Muslims surrendered the city of Acre in 1191. The Templars were also known to possess the head of Saint Euphemia of Chalcedon, and the subject of relics came up during the Inquisition of the Templars, as several trial documents refer to the worship of an idol of some type, referred to in some cases as a cat, a bearded head, or in some cases as Baphomet. This accusation of idol worship levied against the Templars has also led to the modern belief by some that the Templars practiced witchcraft. However, modern scholars generally explain the name Baphomet from the trial documents as simply a French misspelling of the name Mahomet (Muhammad). The Holy Grail quickly became associated with the Templars, even in the 12th century. The first Grail romance, Le Conte du Graal, was written around 1180 by Chrétien de Troyes, who came from the same area where the Council of Troyes had officially sanctioned the Templars' Order. Perhaps twenty years later Parzival, Wolfram von Eschenbach's version of the tale, refers to knights called "Templeisen" guarding the Grail Kingdom. Another hero of the Grail quest, Sir Galahad (a 13th-century literary invention of monks from St. Bernard's Cistercian Order) was depicted bearing a shield with the cross of Saint George, similar to the Templars' insignia: this version presented the "Holy" Grail as a Christian relic. A legend developed that since the Templars had their headquarters at the Temple Mount in Jerusalem, they must have excavated in search of relics, found the Grail, and then proceeded to keep it in secret and guard it with their lives. However, in the extensive documents of the Templar inquisition there was never a single mention of anything like a Grail relic, let alone its possession by the Templars, nor is there any evidence that a Templar wrote a Grail Romance. In reality, most mainstream scholars agree that the story of the Grail was just that, a literary fiction that began circulating in medieval times. Another legendary object that is claimed to have some connection with the Templars is the Shroud of Turin. In 1357, the shroud was first publicly displayed by a nobleman known as Geoffrey of Charney,described by some sources as being a member of the family of the grandson of Geoffroi de Charney, who was burned at the stake with De Molay.He shroud's origins are still a matter of controversy, but in 1988, a carbon dating analysis concluded that the shroud was made between 1260 and 1390, a span that includes the last half-century of the Templars' existence. ​The validity of the dating methodology has subsequently been called into question, and the age of the shroud is still the subject of much debate despite the existence of a 1389 Memorandum by Bishop Pierre D'Arcis to the Avignon Antipope Clement VII mentioning that the image had previously been denounced by his predecessor Henri de Poitiers (Bishop of Troyes 1353-1370), stating "Eventually, after diligent inquiry and examination, he discovered how the said cloth had been cunningly painted, the truth being attested by the artist who had painted it, to wit, that it was a work of human skill and not miraculously wrought or bestowed. until 1813 when it united with the Ancient Grand Lodge of England to create the United Grand Lodge of England. It was the first Masonic Grand Lodge to be created. The basic principles of the Grand Lodge of England were inspired by the ideal of tolerance and universal understanding of the Enlightenment and by the Scientific Revolution of the 17th century (Age of Reason). Welcome to the Grand Lodge of Ireland Web-Site designed to provide everyone with an insight into Irish Freemasonry and its activities. Freemasonry is kindness in the home, honesty in business, courtesy in society, earnest in work, pity and concern for the unfortunate, resistance towards evil, help for the weak, forgiveness for the penitent, love for one another and reverence and love for God. Freemasonry is many things, but above all, Freemasonry is a way of life, not "apart" from society but a "part of society". In the year 2008 we held our third "Grand Master's Festival of Charity" during which we raised £600,000 for very worthy Non-Masonic Charities. On this occasion the three charities were, The Samaritans, The Northern Ireland Children's Hospice and the Laura Lynn Children's Hospice Foundation. We are the second oldest Grand Lodge in the World. Freemasonry brings men of goodwill together to enjoy one another's company and to continue our traditions dating back hundreds of years. It fulfils as great a need to-day as it did then. Our Lodges are located all over the island of Ireland and in many Countries overseas. It is said that the sun never sets on Irish Freemasonry. This web-site enables our Brethren near and far to be close to us at all times. We hope that non-Masonic visitors to the web-site will find it interesting and informative. If you require further information, please do not hesitate to contact us. 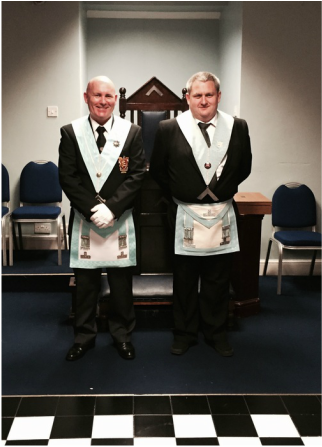 Welcome to the web site of the Grand Lodge of Scotland. Grand Lodge has had its own web site since 1998 which was initially designed and maintained by the late Brother Willie Davidson and it grew considerably under his guidance. However, the addition of large amounts of new material made it difficult to navigate. The new site was designed to be easier to move around whilst including the huge amount of material that was to be found on the old site. The site that you are viewing now is the third incarnation of the Grand Lodge of Scotland's web site and which came online in early January 2011. Some problems occurred during the course of changing to this new-look site and some material failed to be transferred. Please be patient as it will take some time to move all the material. The old sites are no longer available online. As well as including (eventually) all the material from the old sites, the new site will continue to provide some new features designed to be of assistance to Lodge Secretaries and others involved in the administration of the Scottish Craft. The Member Services page will allow, after registration, Secretaries and others to download Quarterly Returns forms and other related documents. In addition other material of more specialist interest will be posted there for download. To go there or on the previous link. In addition at the top right after 'Grand Lodge - Introduction' there are two symbols. Whilst familiar to some, those of us not so familiar with the internet, computers etc. may like some explanation. Clicking on the first symbol will convert the text on the page into a PDF document which allows it to be saved as a file and/or printed easily without all the surrounding images, borders etc. ​This will appear in a new window and other options available are displayed there. Clicking on the second symbol will print the entire page with all the illustrations etc. The previous web site had a third symbol that allowed the page to be brought to the attention of others by e-mailing a page link. This facility has been withdrawn from this new site as it was being used to generate spam. This is a matter of regret but some people out there in cyberspace abuse such useful tools to the detriment of all. This is not the same as the Masonophobic web sites discussed elsewhere on this site. To read a discussion on that subject or on the previous link. As has been said this site is designed to be easily navigable using the top navigation bar. However it is possible occasionally to become lost but by clicking on the Grand Lodge 'coat of arms' (at the very top left of each page) and you will always be returned to the first page.